Developed from the Bofors 40 mm/60 Model 1936, the 40 mm/70 Model 1948 was originally designed to replace the older weapon's twin mountings with single mounts by having double the rate of fire (ROF) of the older weapon. 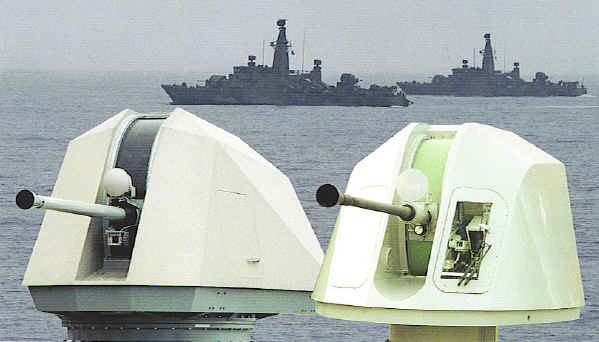 Newer, faster-firing versions of this weapon are still in production by Breda as well as by Bofors (now BAE). All of these 40 mm/70 guns use gravity feed magazines whose designs are directly descended from those for the 40 mm/60 Model 1936. Unlike the earlier weapon, all Bofors 40 mm/70 guns are air-cooled, there are no water-cooled versions. The original Model 1948 (Officially, 40 mm Luftvärnsautomatkanon M/48) was a land gun while the SAK-40/L70 series used the same gun but with mountings designed for naval applications. The Model 1958 was a modernized SAK mounting first used by the Bundesmarine (Federal Republic of Germany) on former USS Fletcher class (DD-445) destroyers supplied under the US military assistance program. Used in both single and twin mountings. 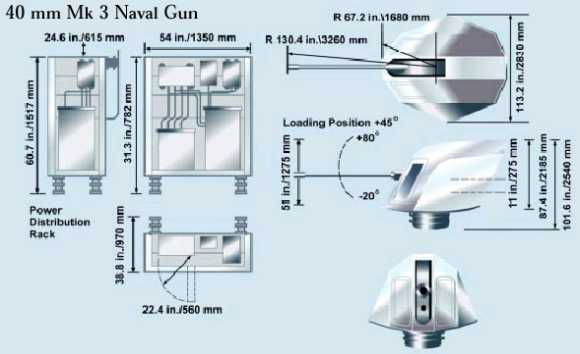 Although an impressive AA gun in the late 1940 to 1960 time frame, the value of such MG AA weapons has decreased since World War II with the increasing sophistication of stand-off anti-ship weapons such as the USA's Harpoon. For that reason, Bofors has developed more sophisticated ammunition such as the 3P round which can be set for point contact or proximity detonation. These improvements, together with a better FCS, allow these weapons to be used against sub-sonic cruise missiles although they are more often intended to be used against small surface craft. In the late 1980s Bofors upgraded the design to the 40/70-SAK-600 (Trinity) standard which has a faster rate of fire and improved reliability. In August 1986 Germany awarded a contract to Bofors to upgrade their guns to the 40/70-SAK-600 standard and these weapons were still in use as of 2006 on Schnellboots and Minecraft. The Mark 3 can be integrated with any analog or digital fire control system. 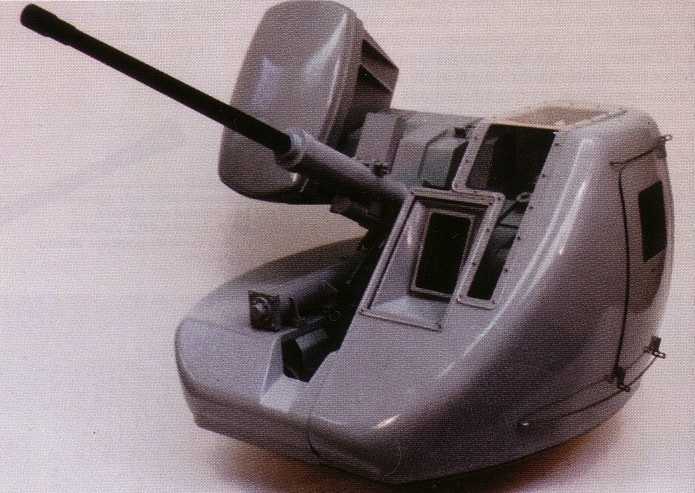 This mounting is normally unmanned and controlled from the combat information center but can be locally controlled from an on-mount operator's console for aiming and will remain fully stabilized by the gun's local gyros. In case of total power supply failure, the gun can be layed and fired manually. A radar on the gun barrel is used for correcting the FCS solution. The Mark 4 is an improved version of the Mark 3 and has replaced the hydraulic drives of earlier designs with all electric motors which reduces the flammability of the mounting and improves reliability. Neither of these mountings have any deck penetration except for electrical connections. The Italian armaments firm of Breda (later OTOBREDA, then OTO Melara) has produced their own versions of the 40 mm/70 under license since 1969. The company has specialized in automatic loading mechanisms which are also used for their own designs, as can be seen on the 40 mm/70 OTOBreda datapage. Bofors was purchased by United Defense which was in turn bought by BAE Systems. SAK and Model 1958 3: 240 rounds per minute. ^In this table, SAK data applies to SAK-40/L70-315, SAK-40/L70-350 and SAK-40/L70-520 naval guns and can be used for the land Model 1948. ^The major difference from the 40 mm/60 Model 1936 to increase the rate of fire was to change how ejected casings are handled. In the 40 mm/70 the loading tray was redesigned so as to tilt up after each round is chambered. When the gun fires, the spent casing is ejected and as soon as it clears the breech ring it strikes the bottom of the tray, deflecting the casing downwards. The rammer then moves forward, pushing the tray down and pushes the next round, in position on top of the tray, into the breech. This change more than doubled the rate of fire compared to the older gun. ^These mountings all use an 18-round autoloader which is fed by the standard four-round clips. ^Proximity fuzing is greater than 33 feet (10 m) for aircraft, 16 feet (5 m) for missiles and 10 feet (3 m) for sea skimmer targets. ^Tracer burns for about 4 seconds. ^Bofors 40 mm 3P ammunition fuze options allow three different proximity modes as well as settings for time, impact and armor piercing requirements. ^By comparison, the Bofors 40 mm/56 cartridge was 40 mm x 311R. ^The Mark 3 uses a dual compartment 101-round magazine. 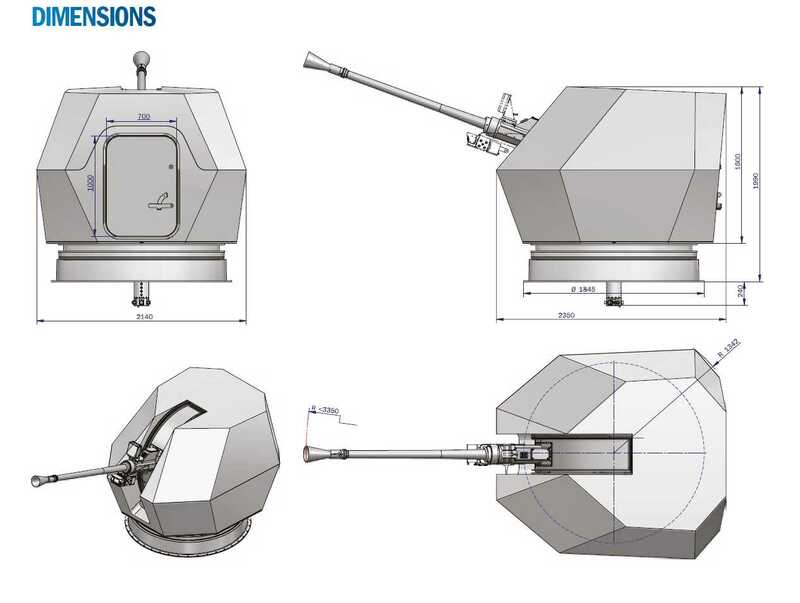 The magazine can be rapidly switched to provide options between the latest Bofors 6 mode programmable 3P rounds and other 40 mm L/70 ammunition types. ^The Mark 4 has a 30-round magazine on the gun which is automatically replenished by a 70-round intermediate magazine. ^1.11.2The SAK series and Sea Trinity mountings employ open shields with the option of a GRP weather cover. ^The 315 had all manual controls to keep costs and weight to the minimum possible. Intended to be used on small patrol boats where AA fire was not a priority. ^The 350 used electro-hydraulic power drives that were intended to be coupled to a remote fire control system. Incorporated gyro systems to allow full stabilization. ^The 520 is similar to the 350 but with the addition of an Automatic Feed Device (AFD) which increased the overall weight but reduced manning down to a single crewman. 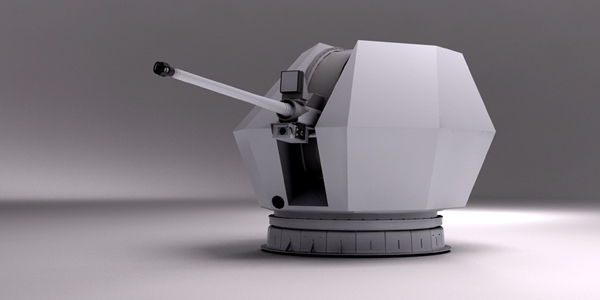 ^Bofors 40 mm Sea Trinity was conceived as a lightweight CIWS with low magnetic signature and enclosed in a manned or unmanned stealthy gunshield. Trinity Spartan uses an off-mount fire control while Trinity normally has an on-board FCS with several options including the Goalkeeper FCS or the Ericsson Eagle radar. ^The Mark 3 is a Stealthy mounting based on the Sea Trinity. ^The Mark 3 operates from 440 Vac 60 Hz three phase power. 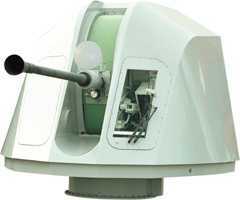 ^Mark 4 includes a video camera on the gun barrel as well as a radar antenna. ^The cupola style weather shield for the SAK series adds (150 kg) to the values in this table. 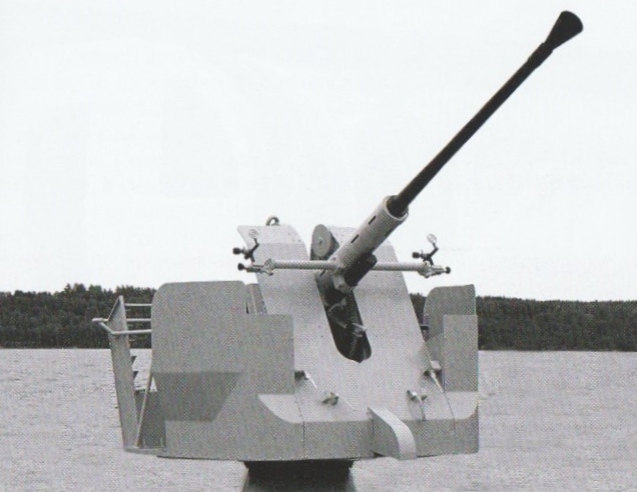 The British Royal Navy had plans for single, twin and sextuple versions (Mark's 10, 11 and 12) of the 40 mm/L70 gun but these were cancelled in 1957 in favor of Sea Cat. 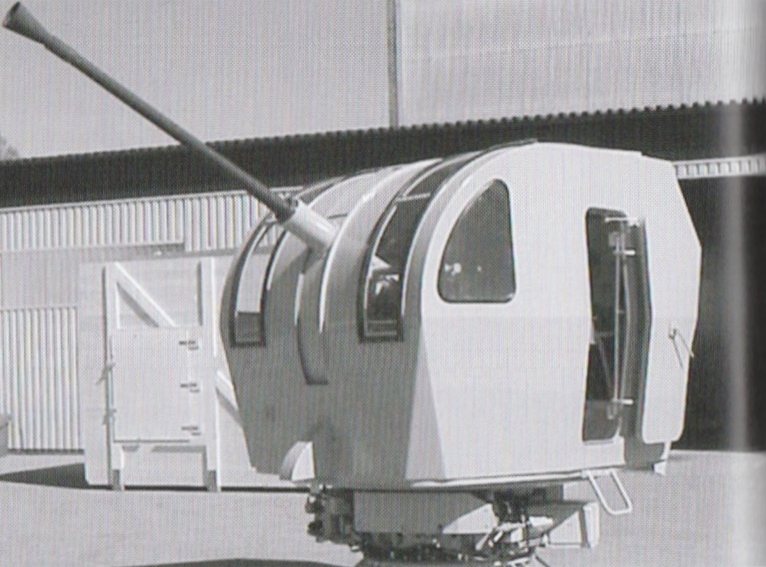 Bofors SAK-40/L70-520 naval mounting with the optional cupola. This mounting used electro-hydraulic drives and was intended to be remotely controlled. Picture copyrighted by Bofors Defence. 40 mm/70 Sea Trinity Mockup. Large container on right of the mounting is the ammunition magazine. Picture copyrighted by Bofors Defence. 40 mm/70 Mark 3 in low RCS mounting. Sketch copyrighted by United Defense. 40 mm/70 Bofors Mark 3. Picture copyrighted by Bofors Defence. Comparison of Bofors 57 mm Mark 3 (left) and 40 mm Mark 3 guns. Picture copyrighted by Bofors Defence. 40 mm/70 in Mark 4 Mounting. Picture copyrighted by BAE Systems. 40 mm/70 Mark 4 Dimensional Sketch. Sketch copyrighted by BAE Systems. 27 February 2018 - Converted to HTML 5 format, added details on naval mountings, reorganized notes and added photographs of SAK mountings.